If you're looking to add some pizzazz to a special event, or simply, to put a smile on a loved one's face, then a bouquet of our purple and orange Rainbow Roses For Sale will do just that. Each purple or orange bud petal contrasts uniquely with the next to create an animated kaleidoscope blossom. 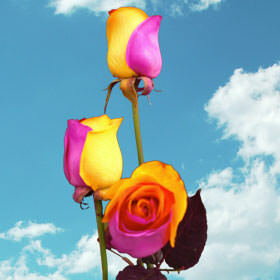 GlobalRose.com has combined orange and purple, colors known to stimulate feelings of happiness and exuberance, to our blossoms through a special dying technique, resulting in a truly electrifying color explosion that exudes pure euphoria. These invigorating florets are a perfect way to congratulate someone special on their big promotion, to lift a loved one's spirits, or to add the perfect splash of color to a birthday party, outdoor wedding, or charity event. We grow all of our products with great care in the warmth of our South American based greenhouses, so they're available for you whenever you desire. We take pride in our reputation of providing the freshest products possible, which is why we cut your blossoms especially for you, your loved one, or special event just days before they arrive at your front door. To ensure that you receive the freshest Rainbow Roses For Sale possible, they will arrive in bulbs that take 2-3 days to blossom, so you can relish in their beauty that much longer. Please note that color tones may vary due to monitor screen, and of course, Mother Nature.